Steven “Steel” Trapp has it — a mind like a steel trap, that is. His mind has gotten him into a fancy private boarding school, but it’s also getting him into trouble. On move-in day at school his prodigious memory is helping him navigate the campus when Steel happens onto a shady lesson. Steel just thinks it’s cool — a school where you get taught to use blow guns? Bring it on! But he finds out pretty quickly that this was a secret lesson when the students and instructor attempt to chase him down. When Steel discovers that his good friend Kaileigh is also a new student, they set out to solve the mystery of the school that isn’t what it seems. Before they know it they’re embroiled in international espionage. 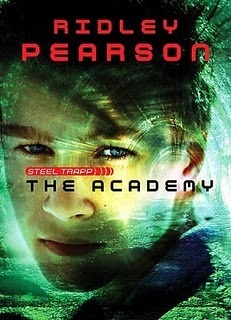 I went looking for a kid spy novel at the library and I found it in Steel Trapp: The Academy! It’s actually the second book in a two book series, but unlike some series I’ve started in the middle, I had no difficulty catching up with the story. This story has enough suspense going to keep even reluctant readers reading and enough twists and turns to keep readers guessing. It’s a very fun read and exactly what I was looking for. This book would be a great addition to classroom and school library shelves. I’m a Boston native and found that the author changed the geography of the city in a few significant ways. That was puzzling as I tried to link my own knowledge with the story and some things were just physically impossible. Also, the author had the kids pull the cord to signal a stop request on the bus. I had to chuckle. I loved the detail, but it’s been at least 15 years since I’ve ridden on a bus here that had pull cords for stop requests. Despite these curious changes, it was fun to read a book that featured Boston. I’ll be looking for Steel Trapp: The Challenge so that I can read about Steel and Kaileigh’s first adventure. 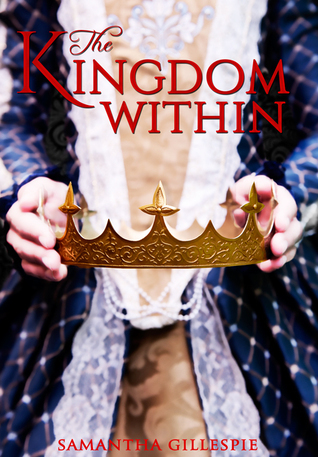 I’ve got one signed hardback copy of Samantha Gillespie’s The Kingdom Within to give away. Use the Rafflecopter Link to the left to enter! The Details: The giveaway is for United States addresses only. The winner will be announced here and on Twitter. I will also attempt to notify the winner by email. The winner has 48 hours to respond to the winning email before a new winner will be chosen. (Please be sure to check your spam folder!) I am not responsible for the book once it has shipped. Little Brown Books for Young Readers, 2013. I only vaguely knew the music of The Supremes when I went off to college. By Christmas break of freshman year I could sing every word of every song they ever recorded. Actually, to be honest, I could probably do that by Columbus Day. I could also sing “It’s My Party and I’ll Cry if I Want To,” but I didn’t, though I occasionally succumb to temptation these days, principally to annoy my kids. Adjusting to living with a stranger–and their music–is a huge part of the freshman year experience. Lauren and Elizabeth are about to be college roommates. Their lives show little in common: Lauren’s from California, where they’ll be going to college, Elizabeth is from New Jersey. Lauren’s looking to get away from roommates; she has a room full of siblings at home. Elizabeth, an only child, is looking for that sister experience. The roommates get in touch after their room assignment letters arrive. Over the course of the summer they carve out the beginning of their roommate relationship, even as they begin to discover who they are in a post-high school world. I found Roomies an engaging read. 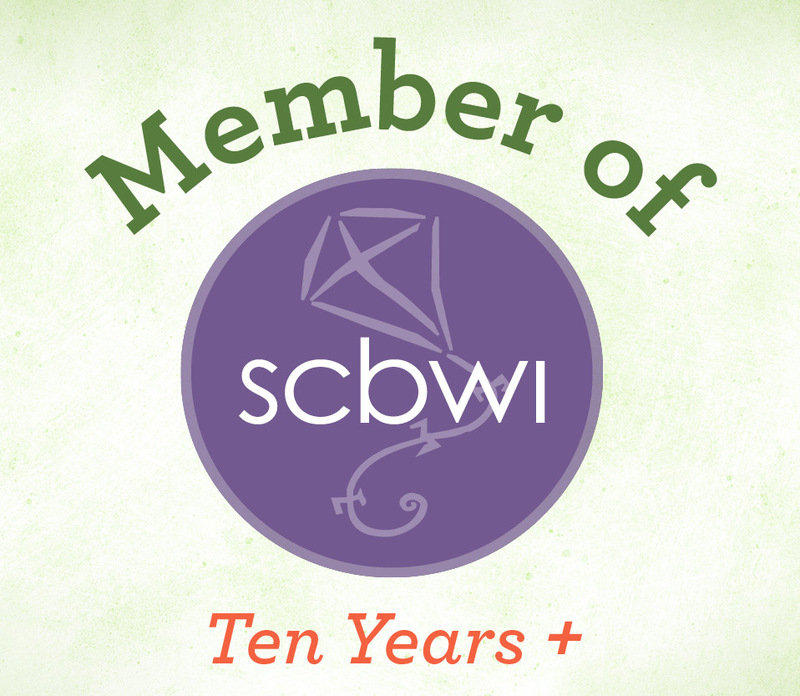 I enjoyed bouncing back and forth between the two characters and their different worlds. The story and characters felt very real in their expectations, their questions, and their fears about what was to come. Both young women changed immensely over the course of the summer. The book leaves the reader at the threshold of the school year with two new roommates who have not yet met—a lovely ending for readers who like to hold on to the possibilities in their own imaginations. 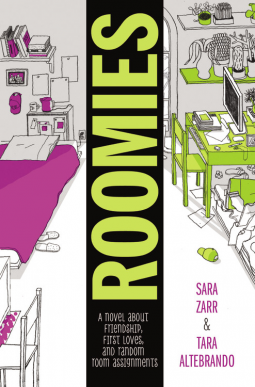 Roomies by Tara Attlebrando and Sara Zarr brought an astonishing number of freshman year memories back to me. It captured perfectly that on-the-cusp feeling of kids who have graduated from high school and mentally moved on but not yet become college students. I think this book will become a favorite high school read. I received Roomies as a promo galley courtesy of Little Brown Books for Young Readers and NetGalley.